Longing for burger? This might just be the right place for you. 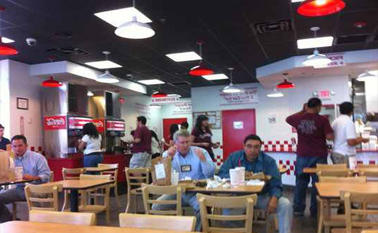 Five Guys serves amazing burgers coupled with friendly service. This place makes a good burger for a reasonable price and there's plenty of peanuts while you wait for your order. There are over 250,000 possible ways to order a burger at Five Guys and they only use fresh ground beef as they don't have freezers, meaning nothing is ever frozen. And best of all, the menu here is trans-fat free.